NEW PLAN TO OUTWIT THIEVES. Scatters Them Over His Person. Joe Lamford, who claims Seattle, Wash., as his residence, spent several hours yesterday trying to pass through the Union depot gates on a tattered ticket. He explained that on his arrival here last Friday he had torn his ticket for Oklahoma City into small pieces and placed them in different pockets to prevent "lifting." Then according to his story he took in Union avenue. After a few days in the workhouse, he tried to get his ticket together. When he presented the various portions in an envelope yesterday, he was given the option of buying another ticket or counting the ties to Oklahoma City. Mark Kelser, formerly of the Kansas City fire department, who trained "Dan" and Joe," the famous team of fire horses which won honors at London in the international exhibit in 1893, was in Kansas City yesterday afternoon, stopping off a few minutes on his way to Excelsior Springs. Kesler is now with the Oklahoma City fire department, where he is engaged in training eight fire horses. He was here a short time ago, having been sent with three other firemen to make a study of the departments of large cities with a view of strengthening the Oklahoma City department. Mrs. E. L. Folsom, 707 East Eighteenth street, weeping bitterly, was lectured by Judge E. E. Porterfield in the juvenile court yesterday for making a false affidavit regarding the age of her son, Lyle H. Wilcox, in the office of W. H. Morgan, state factory inspector, recently when the boy went to work. She swore that he was born April 7, 1895, but yesterday admitted that he was born a year later. While under oath, as the court learned from private conversation with the woman's daughter, other misstatements were made. "You ought to be punished," said Judge Porterfield, "for making the false affidavit about your son's age and for other statements made here under oath, but I cannot do it in this court. It could be done in the criminal court, however. This habit people have gotten into of making false affidavits of their children's ages before the factory inspector has got to be broken up. Somebody is going to be punished, too, if it does not cease." 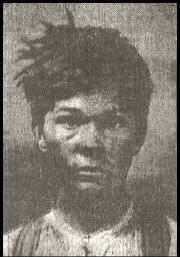 The boy, Lyle, was given into the custody of his sister, Mrs. Iva Hubbard, 1405 Spruce avenue. Mrs. Folson said she had born ten children, seven of whom are living. She said she was divorced from Joseph Wilcox in Oklahoma City, Ok., and that seven years ago in January she was married to Folson. She Used a Hired Machine. "Just wait until my 'guardy' gets back to Pawhuska, and I will be willing to make a wager that he allows me the money to get a machine," said Mrs. Blanche Keeler, the pretty Indian widow who, though very wealthy, has been denied an automobile because Eugene Scott, trustee of her estate, thinks that it would be extravagance for her to have it. "I could not have used one of my own any oftener than I have a hired one since last Saturday, when I arrived here," said Mrs. Keeler, "so I guess if I come up to Kansas City often enough I could do without one of my own. "I want an auto for my home in Pawhuska, and I am going to have it. Mr. Scott will come around to my way of thinking. I just know that he will, for it won't be a bit extravagant for me to own a machine, and it will be of much benefit to my health. The ponies and horses are all right, but I want action, something faster than horse-flesh." With three big trunks packed to their capacity with pictures, new clothes, music and books, Mrs. Keeler departed early this morning for her home in Oklahoma. "I did not get what I wanted, an auto, but I am taking back with me all the pretty things I fancied while here," said Mrs. Keeler at the Hotel Victoria last night. ested in the Crop Prospects. Only twenty-five men responded yesterday morning at the roll call of the Quantrell guerrillas, now in reunion in Independence. Cole Younger was not present, being on a lecture tour, the subject of his lecture being "Keep Straight." Frank James, another noted guerrilla, is down in Oklahoma in the Big Pasture, farming, and did not have time to attend. James has not attended any of the reunions since his noted speech made in the Independence court house yard, in which he declared that his friends were in the North and that he was never turned down except by those of the Southland. The headquarters of the reunion were in the Brown building, North Main street. Here the scattered membership met and registered and it was here that it was noted that among the absent ones were John C. Hope, ex-sheriff of Jackson county, and Cyrus Flannery Wolf of Bates county, both having died within the past year. Captain Benjamin Morrow was present, Lieutenant Levi Potts of Grain Valley and Warren Welch were busy among the veteran guerrillas. Captain Gregg, who has been in about as many tight places as the next guerrilla who followed Quantrell, was present with his family. Also Dr. L. C. Miller of Knobnoster. There was no formality about the reunion. "They just met and that was all there was to it," was the way one of them expressed himself. Some of those from Kansas City and nearby points brought well-filled dinner baskets, but the greater portion of those present had to go to restaurants. It was a day of reminiscent stories for the guerrillas and the oft repeated stories of the civil war were gone over and over again. Gabe Parr, who as a boy shot his way to freedom, yet lives, and others with equally hair raising stories were present and passed the day, telling of the yesterdays of their early manhood. The thing that interested these men most was the state of the crops. The veterans will hold another session today and adjourn, in all probability to meet in Independence next year. $2,000 Currency in His Pocket. With $2,000 in currency in his pockets, Gus Schneider, a cattle raiser of Enid, Ok., was attacked with appendicitis while waiting for a train in the Union depot last night, and was discovered unconscious by Mrs. Ollie Everingham, the depot matron. Mrs. Everingham gave him emergency treatment until a physician, Dr. R. O. Cross, was secured from among the waiting travelers. Schneider brought his cattle to the stock yards Saturday night. They were sold yesterday, and after dinner he walked to the depot. He did not feel well, and selected a seat near a window. He was attacked by pains in the stomach and it is presumed he lost conscious shortly afterwards. Several phone calls were put in for physicians, all of whom happened to be out. One of the callers then used a megaphone in the waiting room, and Dr. Cross responded. Dr. Cross lives at Lahoma, Ok., and was on his way home. He accompanied Schneider on the train. TOO HOT FOR HER HERE. to Her Home at Enid. It was so hot in Kansas City yesterday afternoon and evening that Mrs. Anna Baker of Enid, Ok., cut short a stay which she intended to make here, and last night returned to her home..
She told officials at the Union depot that the farther north she came the hotter it got. CUT IN TWO ON CAR TRACK. ered at Walnut and Second. While rounding the curve in the old Holmes street cut on Second street between Walnut street and Grand avenue at midnight last night, J. A. Franklin, the motorman of a Vine street car, noticed that his car bumped slightly at one particular place. He stopped the car, got off and went back to investigate. In the middle of the track was the body of a man which had evidently been lying there for several hours. More than a dozen cars had passed over the body before any one noticed it. Dr. Harry Czarlinsky was notified and ordered it taken to an undertaker. From papers found in the dead man's pockets it was presumed that his name is Walter A. Rosh of Enid, Ok.
MUSKOGEE, OK., May 31. -- E. Stanton Stofer, third baseman for the Muskogee team in the Western Association, and Miss Estella Greenwood of Kansas City, were married here this afternoon. The players of the team made up a purse for the bridegroom, and President Shantz of the club will tomorrow night entertain the couple with a dinner and automobile ride. The young woman came here from Kansas City. Stofer, who is also from Kansas City, is touted as the fastest kid infielder in the league. He is a personal friend and protege of Johnny Kling. Following the City Hall Riot. Acrid exchanges of words between attorneys and the release of William Enghnell, a member of James Sharp's band, from the county jail, brought interest to the closing hour of the Adam God hearing for yesterday. The day had been one of lagging testimony, largely by deposition, and court and spectators, as well as the jury, were weary when, at 4:30 o'clock, Enghnell, 20 years old, who does not appear bright, marched to the witness stand. He had been brought out of his cell on a former day of the trial, but taken back before he had a chance to testify. On the stand Enghnell spoke with a pronounced Swedish dialect. He said he had lived in Kitchen county, Minn.
"Who is this?" asked A. E. Martin, counsel for the fanatic, Sharp, indicating the defendant. "HE IS THE LORD," SAYS BOY. "By what other name do you know him?" "He is the Lord," said the boy, reverently. "How long have you known Sharp?" "I met him a year ago in Kitchen county, and hear him preach." Judge Ralph S. Latshaw of the criminal court here turned to Enghnell and told him not to testify to anything that might tend to incriminate himself. Immediately Virgil Conkling, prosecutor, was on his feet. "If the court please," said he, "the state wishes to dismiss any information that may be pending against Enghnell. The state will not prosecute him for anything. He was not present at the shooting." "Why are you in jail, Enghnell?" "They had me arrested for believing the truth and Adam. I met him and God revealed to me that He was Adam, and I got the faith." The witness started to tell what he saw of the shooting on the river, but was stopped by an objection by Mr. Conkling. "I object. There you go stopping one of my best witnesses. Object, object," he continued, punching Martin in the back. "Let him tell what he knows about that killing," shouted Sharp. "That's the truth," called out the boy in the voice of a zealot. GUNS TO KEEP OFF EVIL. "Sharp believed in killing people, didn't he?" "No," said the boy. "Letting all people alone was our doctrine." "Why did you have guns?" "I heard Adam say that all through the South, where he had been preaching, they had been putting him in jail, and he had the guns to keep the evil men off him." "Now don't let him get more than twenty-five minutes from the shooting," called out Sharp. "They wouldn't let the others tell what happened twenty-five minutes afterward. Why should this boy tell what happened more than twenty-five minutes before the shooting?" The interruption was too much for Martin, who jumped in and said, "For two or three days I've resisted putting this boy on the stand. I was forced to do so by the defendant." "Mr. Martin is 21 years old, a member of the bar and ought to be able to conduct a criminal case or resign," said Mr. conkling frigidly. By this time the prosecutor was on his feet and continued: "I don't think you ought to take this position before the jury." "Are there any other witnesses they are trying to force you to put on, Mr. Martin?" asked Judge Latshaw. "If there are, I will protect you." "If you object," said Mr. Conkling, "I shall not examine this witness further. I don't want to be unfair." Martin had none, so the questioning about the guns was resumed by the prosecutor. "Sharp took the guns up town to protect him from the evil man," said the boy Enghnell. "Did you give him some of the guns?" "When I got into the faith I gave Adam my two pistols. I saw he was David, the father, and I gave everything I had to him." "What else did you give him?" "Because he told you he was Adam?" "No. God revealed it to me." "Revealed it to Sharp, too, didn't he?" "When you offered him the $5, you had a hard time to get him to take it, didn't you?" "What did he say about you not having nerve to use pistols?" As soon as this answer had been given, Mr. Conkling accused Martin of shaking his head at the witness and objected to such alleged acts. martin denied them, but Conkling persisted. "Did Sharp tell you that if anybody stopped him from preaching there would be war? the prosecutor asked the witness. "Did he say if they didn't let him do what he wanted he would shoot?" "Did Sharp tell you that perhaps this was the town God wanted him to take?" "Did he say he had to fire the first shot and then they all could shoot?" "Did he say he proposed never to be put in jail again?" "Did he tell you he bought the guns to keep the police from arresting him?" "Were you with Sharp w hen he stood off the Canadian police?" "Stood them off with a rifle, didn't he?" "And the next day he stood off several?" "Then they sent fifty Canadian police after him and he stood them off with a rifle?" "All of you who joined the band got revelations to give Sharp your money, didn't you?" "Yes, we got revelations. God showed us." "Did Sharp say he would do like David did to the Philistine with his knife?" This concluded the examination of Enghnell, who was set at liberty. He was taken in charge by Mrs. Alice Stultz, a mission worker at 1418 Oak street, who said she would care for him. Court then adjourned for the day. The reference Enghnell made in his testimony to Sharp taking the city had to do with a claim he made to his followers in connection with Joshua and Jericho. Sharp himself did not take the stand yesterday, and it is possible that neither he nor his wife will be used as witnesses. The case may be finished today, as there remains little evidence to be put before the jury unless the Sharps go on the stand. Mr. Martin was unwilling last night to allow Sharp or his wife to testify, but added that they might override his wishes. During the afternoon there were read by A. A. Bailey of Sharp's counsel depositions taken early this month in Oklahoma City. L. A. Sheldon, a real estate dealer who was a jailer there in February, 1905, said that the Sharps were in his charge for about sixty days that year. This was just after the naked parade. "Sharp told me," said Sheldon, "that he came naked into the world and would go out that way. He preached and sang in the jail day and night so that one couldn't sleep in the jail office. He said also he was God and was generally 'nutty' on religion. His mental condition was 'mighty weak'. "This naked parade was on Broadway in the afternoon. There were four of them in it." James Bruce of Oklahoma City, who had the contract for feeding prisoners at the jail when Sharp was confined there, said he seemed to be rational on all subjects except religion. Sharp, so said Bruce, had a "very elegant beard," which reached almost to his waist. "I told him," said Bruce, "that I wanted his whiskers and when I got back there he had cut them off with a pocket knife and had them in an envelope. 'Keep these and they will make you religious,' he said to me. I learned from neighbors that Pratt gave Sharp over $3,000, realized from the sale of Pratt's farm." ASKED TOO MUCH FOR FARM. John Tobin, a retired farmer of Oklahoma City, saw Sharp's band in their camp near Oklahoma City in the spring of 1905. He said he wanted to buy the farm (Pratt's), but that Sharp asked $6,000, or $1,000 more than it was worth. John Ballard, a deputy sheriff, saw the naked parade. John W. Hanson, assistant county attorney, who was police judge of Oklahoma City in 1905, gave it as his opinion that Sharp was sane. "He told me," the witness said, "that the constitution of the United States guaranteed him the right to preach on the streets. This was after he had been arrested for blockading the streets." Oklahoma City to Get Evidence. In preparation for the trial of James Sharp and Melissa Sharp, fanatic leaders of the city hall riot last December, Virgil Conkling, prosecuting attorney, has gone to Oklahoma City. A large part of the defense will be in the form of depositions from persons who do not care to come to Kansas City for the trial May 17. As only the defense may introduce depositions in evidence, Mr. Conkling has gone to cross-examine the witnesses. The evidence to be gathered in Oklahoma bears largely on the conduct of the Sharps while they were leaders of a band in that state. The police are positive that Mrs. Helen Yarbrough, who committed suicide in the Manhattan hotel in Wichita Friday night, was in Kansas City several weeks ago. She was wanted at Claremore, Ok., on a charge of complicity in the murder of John Bullette, and rather than face the officers she took strychnine. Detectives had been looking for Mrs. Yarbrough in Kansas City for several days. With the aid of a photograph she was traced to an East Side boarding house, where she had stopped during the month of March. She left ostensibly for Topeka April 7, but went to Claremore instead. The murder was one of the most brutal on record in Oklahoma. While in Kansas City Mrs. Yarbrough had no callers and made no friends. Three weeks ago Nellie May Wylie, 13 years old, disappeared from her country home near Woodward, Ok. At the same time George Lovett, 30 years old, who had been known to pay the girl some friendly attention, also disappeared. No trace whatever could be found of the missing girl until recently, when a sister at Woodward got a letter from her postmarked at Broken Bow, Neb. To that she had signed the name of Mrs. Abraham Whistler." 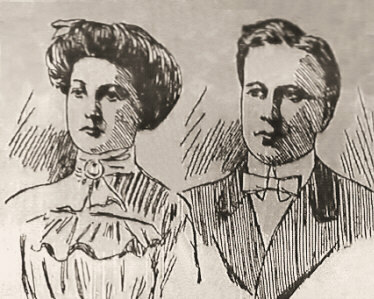 The girl's father, L. A. Wylie, placed the matter in the hands of the sheriff at home, and a wire sent to Broken Bow brought the information that the pair had left there and had directed that their mail be sent to Kansas City. About 4 o'clock yesterday afternoon Patrolman J. R. Robeson of No. 6 station arrested the couple near the postoffice, Ninth street and Grand avenue. To her uncle, E. L. Wylie, who came on from Woodward, his niece is said to have confessed that she and Lovett had not married. She will be taken home this morning by the uncle. Lovett is locked up at police headquarters for investigation. MY! WHAT'S THIS? A BRIBE? Purchases on Union Depot Floor. Are fond husbands in Oklahoma and Kansas bribed to stay at home and care for the little ones while mother comes to Kansas City to shop and attend to the family's business affairs? And is the bribe in the form of liquor? Union depot employes believe that both questions could be truthfully answered in the affirmative for two sad accidents that occurred yesterday at the Union station tend to support their opinions in the matter. The first mishap was when an attractive young matron hurrying to catch a train let a neatly wrapped package fall to the floor with crash. Following the crash there was a flow of real old Kentucky bourbon. A few minutes later another woman had a similar misfortune. "My, John will be mad," the woman from Oklahoma murmured. "Fred will be awfully disappointed," said the woman from Kansas. "Hello, Jim. Glad I didn't hit you that time down at Vinita." The other man, dressed in the fez of a Shriner and evening clothes, turned and looked at the man who addressed him but did not recognize in the sombrero topped circus rider before him the fleeing desperado who had turned in his saddle ten years before on the Oklahoma plain and so nearly snuffed out his life with a bullet. Dalton introduced himself and the other, J. H. Knapp, president of Knapp Construction Company, grasped the hand of the brown skinned man in his own. "And I'm glad I didn't hit you," he said. For half an hour the men stood there talking, and parted friends. Emmet Dalton is the youngest of the old Dalton gang. Knapp was at that time a special officer for the Wells-Fargo Express Company. While chasing the Dalton brothers the incident occurred which both remembered so clearly. They became separated from the others and Knapp took several shots at the fleeing outlaw, which the latter returned, but neither was hurt. Dalton's horse finally outstripped that of the officer and he got away. Dalton is with the 101 Ranch Wild West show and is taking part in the Rhoda Royal exhibition to keep in training in the winter. He was released from Leavenworth prison three years ago, where he served seven years.